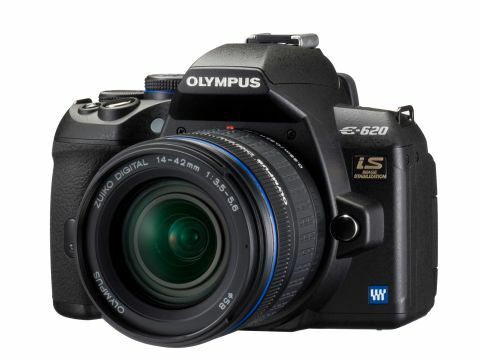 The Olympus E-620 DSLR fits snugly between the E-30 and the recently announced E-450, in the middle of the Olympus 'E' range. All three cameras incorporate the Four Thirds system – which is almost six years old now, and remains unique as the only DSLR system that was designed from the ground up for digital imaging. Other manufacturers, like Canon, Nikon and Pentax, just adapted their film-based cameras and lenses to take digital pictures, but Olympus, and other members of the Four Thirds consortium like Panasonic, decided to wipe the slate clean and start from scratch. Obviously, this approach carried risks, not least the enormous research and development costs, but it has benefits as well. Theoretically, cameras and lenses that are designed specifically for digital imaging will produce better results than older models, originally designed for film use. In addition to the theoretical gains in image quality, the small size of the Four Thirds sensor (which fits almost four times into a full-frame sensor) means that the accompanying cameras and lenses can be made smaller as well, and closer to the form factor of high-end 'bridge' type compacts. Although the Olympus E-620 is hardly any larger than predecessors like the popular E-420, it is considerably better specified. In fact in terms of features, very little separates it from the much more expensive E-30. The Live-MOS sensor offers an effective resolution of 12.3 million pixels, and like the E-30, the 230,000 pixel LCD screen can be fully articulated, so with Live View activated, getting a picture in a tight corner is easy. One of the major selling points of the E-30 and its big brother the E-3, is a really quick Live View system, which incorporates very responsive contrast-detection autofocus. Contrast detection AF is essentially how compact digital cameras operate, using the main imaging sensor to determine correct focus. One of the unfortunately hallmarks of earlier E-system cameras was their sluggish phase-detection AF, but the E-620 is pretty good, and certainly better than the cameras that have gone before it. The 7-point AF system isn't responsive enough to track a fast-moving subject with the same accuracy of some of its competitors, but it's plenty fast enough for normal use. As far as the all-important image quality is concerned, the E-620 offers a mixed bag. Results in JPEG mode at ISO 100 and 200 are crisp and punchy, thanks partly to slightly overaggressive default sharpening, but noise levels from the Live-MOS sensor are fairly high at ISO 400 and above. It isn't unusual for cameras with small sensors to suffer from high noise levels, and the E-620 is noticeably noisier than most current APS-C and full-frame DSLRs. That said, at the most common print sizes of A4 and smaller, the E-620 shines, and the sheer amount of features that Olympus has managed to pack into its diminutive frame is astounding. No other camera offers such advanced Live View functionality along with a flip-out screen, inbuilt image stabilisation and sensor-cleaning in such a tiny form. The 14-45mm (28-90mm equivalent) kit zoom isn't the best in Olympus' range, but like the camera it is charmingly tiny, making the E-620 highly portable, as well as highly desirable.